The holy town of Puri has a lot more to offer other than pilgrimages. At least that’s what I always believed. Although the town is deep-rooted in religion, there is a lot more to this eastern coastal town than what meets the eye. From historic significance to rich natural treasures, and everything in between, the real explorer can find it all. With these thoughts in mind, I and a few friends planned a road trip right after the New Year. The weather was just about right to hit the highway. Also, this was the perfect season to spot migratory birds that swarm the region, especially the large water bodies. We booked a cheap and comfortable cab in Bhubaneswar, so we could navigate the route easily and travel without worry. The exact distance between Bhubaneswar and Puri is about 60 Km and takes only 1.5 hours or at the most two. But I am not the kinds to sit quietly on a road trip. After all, isn’t a road trip meant to have interesting stopovers and detours? Because that is when things get really interesting and memorable. So we started early morning from the capital and headed on the Badshahi Road. The faint winter sun had cast a warm, yellow glow across the morning sky. As soon as we headed on the highway and left the city of Bhubaneswar behind, we were greeted with greenery. The grey concrete skyscrapers were replaced by wide views of paddy fields and thinly foliaged trees, with small country houses. We rolled down the windows, humming to the car radio the cabbie was playing and felt the cool breeze. It was indeed the most refreshing feeling to have, after a long month of working and partying. This is the kind of the trip that truly rejuvenates me inside out and each one of us took the opportunity to relax and absorb the surrounding nature as much as we could. We stopped at a small roadside eatery near Pipli. This was one of those rural destinations that I always thought of visiting but never managed to. But this time, it looked like an opportunity just landed on my lap. So after our morning refreshments, we requested the cab driver to take us around the village. The village (now almost a town) is known for its contribution to Indian folk art. Despite commercialization flowing into the community, I could still feel the underlying rustic charm. Most of the houses there were made of mud and thatched roof, but beautifully decorated with hand-painted motifs and figurines. Traditionally, Pipli is known for the most innovative applique work on fabrics and other textile-based crafts. The marketplace was lined with shops selling colorful fares of all kinds like bags, accessories, home décor, apparel, upholstery, and the famous Orissa-style umbrellas. We walked around, talking to artisans and learning about their craft, clicking a photo every now and then, trying to capture the vibrancy of the community. Soon, we headed back on the highway and by afternoon, we reached Puri. The beach town doubles up as a famous holiday destination for locals and tourists from the eastern states, as well as a significant pilgrimage site. However, we had other plans. As a group of bird lovers, we planned to explore the Chilika Lake. The huge water body sits nearly 104 Km from Puri town and takes another two hours to reach. Thankfully, there were decent lodging options for us to stay over for the night. 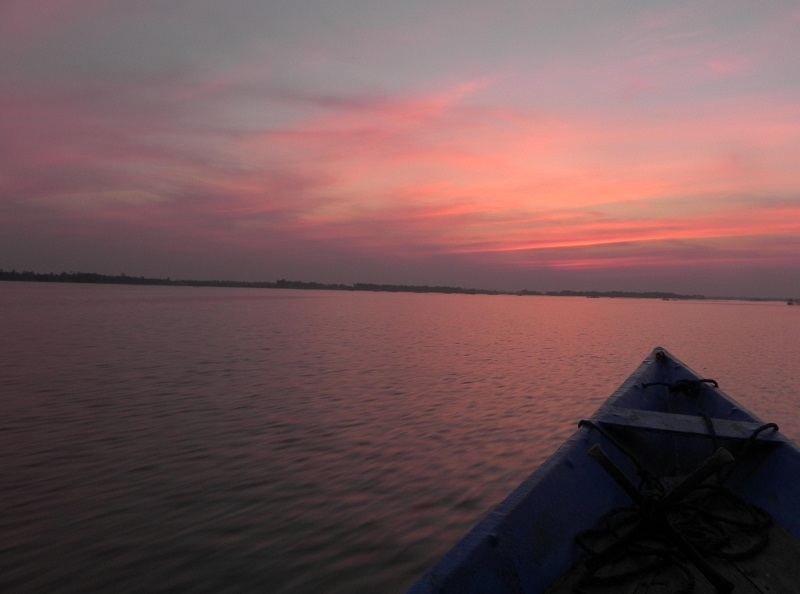 Chilika Lake is famous as Asia’s largest internal saltwater pond. Being very close to the Bay of Bengal, it channels the sea inlet on one side and the freshwater streams from the Daya River on the river. The lagoon is so big that it spreads over three districts in Orissa- namely Puri, Khurda, and Ganjam. We took a boat ride and explored the lake. The lake itself was a thing of pristine beauty. The water surface was dotted with small islands and flanked by mangrove vegetation on all sides. These pockets of trees and soil formed an oasis for migratory birds who come flocking every winter and spend nearly six to eight months nesting on the lake. I had heard of the most exotic species of birds like the white-bellied sea eagles, graylag geese, purple moorhen, herons, and more, who make Chilika their homes during migration. However, that day, we could spot a flock of painted storks, terns, and darters. And thus, we turned a simple day trip to Puri into an adventure with interesting pit stops and altering our destination and made it a memorable weekend for all of us! If you are traveling in the summer months, book an AC taxi from Bhubaneswar to Puri. Don’t forget to check out the Baliharachandi Beach in Puri, which is less commercial and more scenic than the popular Puri beach.